Today, let us dive into the East Sikkim Travel Guide where I will share with you some comprehensive details about this lovely place in North East India. There are some fabulous places in this region which all walks of tourists or call them travelers, can enjoy in this part of Sikkim. It has a mix of tourist and offbeat places of Sikkim. Ever heard of Lhasa? Probably yes. It was and still is the administrative and cultural headquarters of the entire Tibet. One of the highest cities of the world by elevation, it was also a major trading hotspot of the ancient times. Do you know what sea-port it was closest to? Probably not, right? The answer is ‘Tamralipta’. Or present day ‘Tamluk’ in West Bengal, India, where now the ‘Haldia’ Port stands as one of the most important shipping ports in eastern India. The distance between Lhasa and Tamluk was a mere 900 KMs. From Chumbi Valley in Tibet, a thin sliced insert of land between India and Bhutan, recently shot to fame for the Doklam stand-off between India and China, across the Nathu La and subsequently through, the majestic hills of East Sikkim before reaching the plains of Bengal. Another route existed proximal to this one through the Jepep La. Sadly, in modern times, this route is no longer important, no longer traversable in its entirety due to “Borders” put in place by “Progressive” humans of the modern period. This trade circuit was just but an offshoot which merged into the historical ancient silk route that connected modern day China to as far as Europe. Chinese Silk was a commodity of luxury and hence was traded extensively, which explains the nomenclature. However, a lot of other intangible things traversed willingly or unwillingly too, with the caravan of horses. Things like knowledge, ideas, religion, cultural exchange, etc. The Indian portion of the route is open for travelers to come and witness. 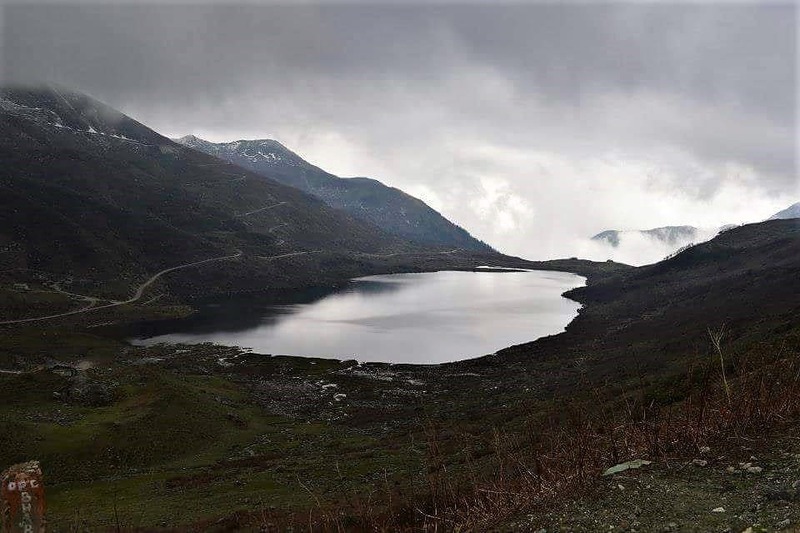 From ‘Rongli’ on the borders of Sikkim and West Bengal, up till ‘Nathu La’, the region is spectacular and remarkably thrilling, besides all the history that it was once a part of. This region is slowly getting the place it deserves on the otherwise flamboyant tourism scene of Sikkim. However, it is thankfully still an ‘off-beat’ destination owing to the absence of any major towns enroute. The road condition is top notch, being maintained by the BRO as a strategically important way for the army vehicles keeping the supply line green to the forward bases at the international border with China. 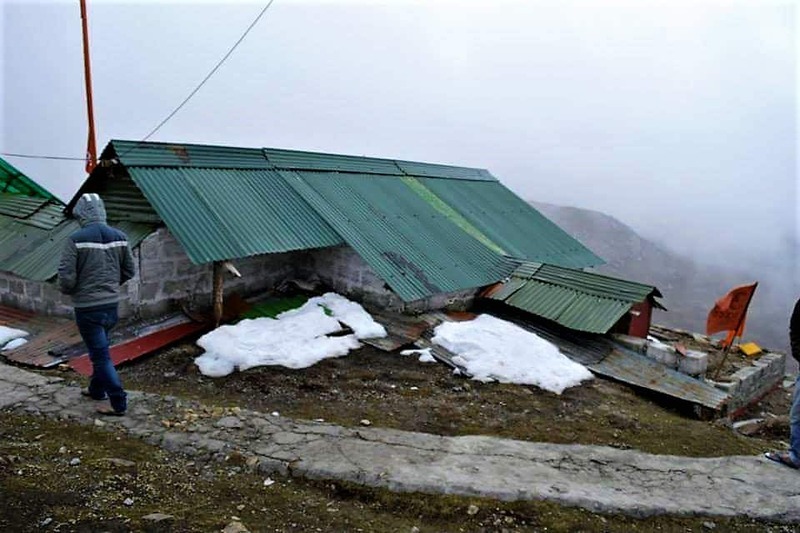 The trail elevates from about 5000ft at Rongli to 14500ft at Nathu La over a span of 70 odd KMs, passing through lush greenery at its beginning, to glacial lakes and icy mountain passes higher up. Ambling by mountain streams, military camps, small mountain villages, waterfalls and viewpoints, the landscapes this route offers are ecstatic to say the least. As discussed briefly in my last article on Gangtok, this route connects with the Tsongo-Nathu La road coming therefrom. So technically the old silk route can be done from both ends. 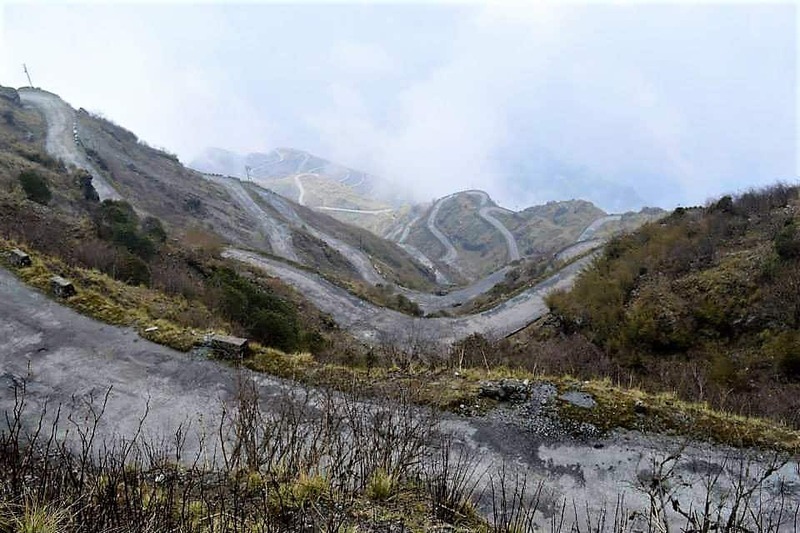 Or else, if wishing to travel the route more comprehensibly without Gangtok, or as is the case in the winter months when the upper stretch gets snowed out, one can start and end from Rongli or any place nearby, traversing up and down the same road. Sillery and Echhey, discussed in an earlier article, can also be the starting or ending points for the old silk route, as they are quite nearby to Rongli. There are not many settlements enroute and for the ones that are there, only basic homestay accommodations are available apart from the places at the foothills near Rongli like Pedong and Aritrar, which have a couple of luxurious resorts. The old silk route, whether traveled from either end, i.e., starting from Gangtok and ending at Rongli, or the other way around will enchant a traveler equally. A small yet important town in east Sikkim. This is the first and the last place in the route which can be called a town for that matter. Set amidst greenery all around and the river Rongpo flowing by it, Rongli can be your first stopover on the first day coming from Siliguri. This place is also important keeping in view that the mandatory ILP (Inner Line Permit) must be obtained from the SDPO office here, to travel up on the old silk route. Many nature trails lead out of Rongli, through forest paths and by the serenely flowing river Rangpo. Rongli being a sub-divisional headquarter, boasts of facilities like police station, ATMs, provision stores, liquor shops, medical facilities, etc. North of here these facilities will gradually become hard to find, so anyone coming up from Rongli, stock up. 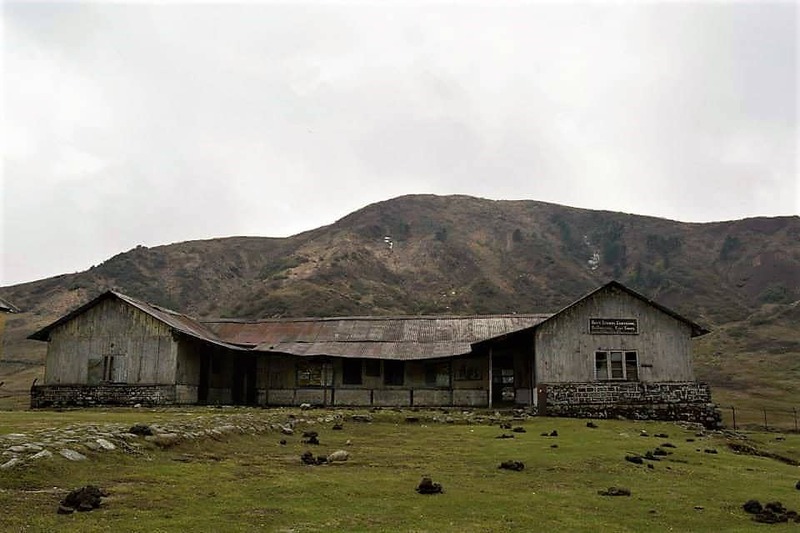 About 20 KMs south of Rongli, at a meagre altitude of around 2000ft, Reshi or Reshikhola is slowly becoming a popular eco-tourism spot. 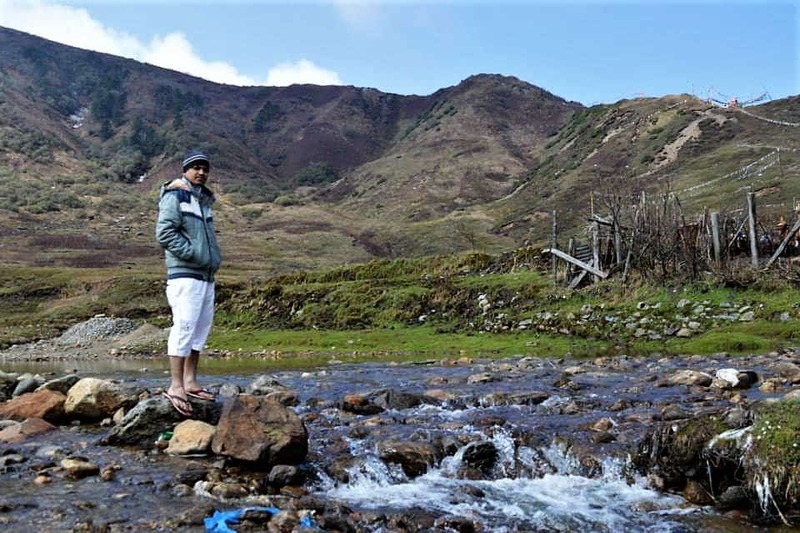 Technically just on the edge of West Bengal, where the river Reshi marks the border with Sikkim, surrounded by evergreen forests and a charming khola (Small rivulet in Nepali), this place was first conceptualized as an eco-tourism destination by a local gentleman named Mr. Sebastian Pradhan around a decade back. In fact, much of what the old silk route has become these days from the view of tourism can be attributed to the effort and farsightedness of this man. He was the one who convinced the locals to start homestays out of their homes in various villages of the circuit. There are now about 5 resorts in Reshikhola including his ‘Eco Prakriti’ which is the oldest. The resorts are all generally wooden cottages by the river stream, on both sides. 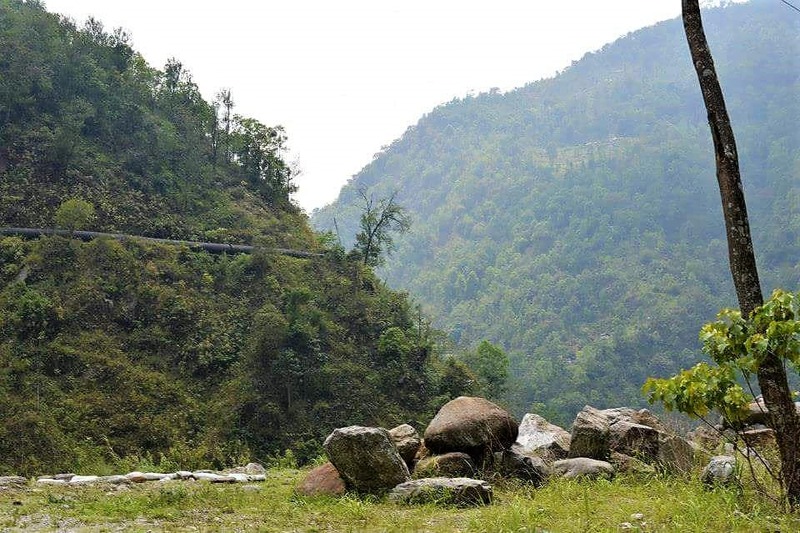 A host of activities like, bonfire by the river bed, angling, taking a dip in the cold gush and walks inside the surrounding forests can be done while at Reshikhola. Reshikhola is one of the most opted starting place for the old silk route, owing to its proximity to Rongli and more importantly its beautiful location almost among nothingness other than a gentle river gushing on with its clear waters, within a circumference of greenery and endless silence. 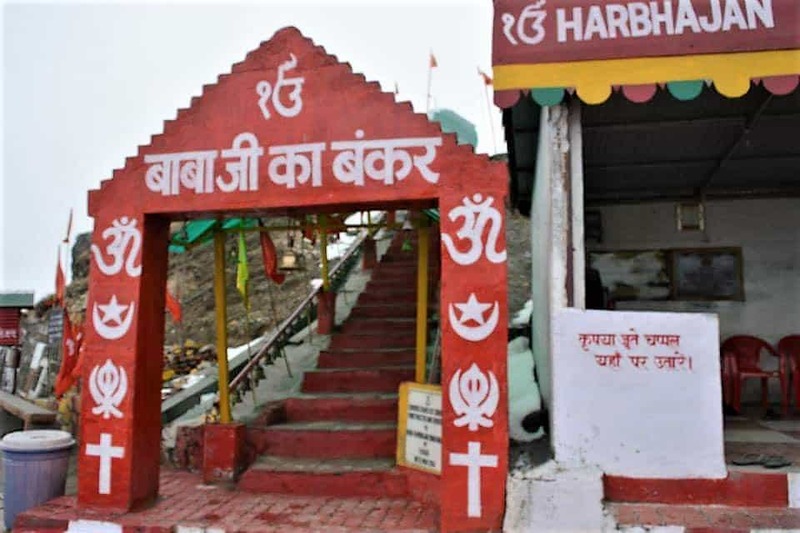 Aritrar, at around 4000 ft. and 20 KMs from Rongli is another popular starting or ending point travelers opt for. This infact is a slight detour from the actual old silk route. 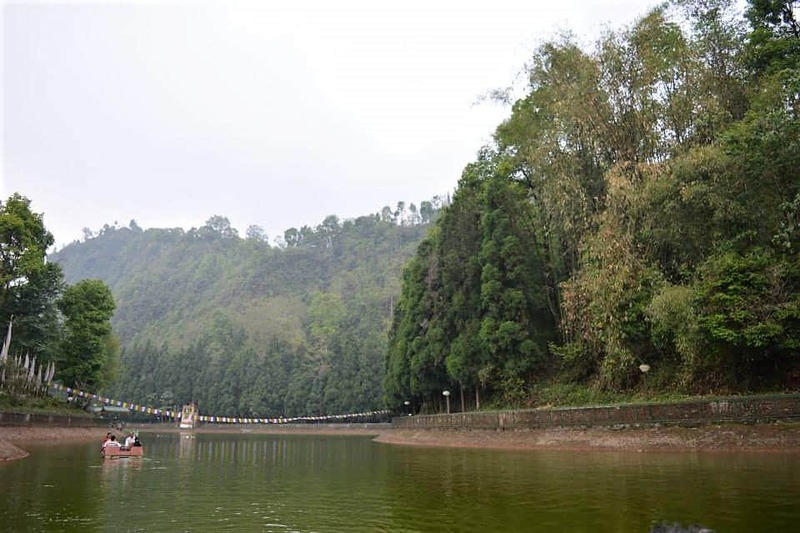 What makes it worth a visit is an Artificial Lake with boating facilities (probably the only one in Sikkim), a British era Dak Bungalow inside a forest which tourists can stay in, and a hilltop view point offering a majestic sight of Mt Kanchenjunga on a clear morning. The lake is called Lampokhari (Pokhari in Nepali means small lake or pond). Earlier a natural lake later artificially reconstructed to facilitate paddle-boating facility, there is also an upscale resort nearby to it called Lampokhari Village Resort. Around 3 KMs and 2000ft uphill from the lake, through a forested trail of occasional Kuccha roads, is Mankhim Top. Enroute which, the Aritrar Dak Bungalow is situated which looks quite appealing from the outside. A night spent in the heritage bungalow with a colonial past must be thrilling too. Mankhim is right at the top of the hill at the foot of which Lampokhari lies. It’s a small village atop a hill inhabited by the Rai ethnic group of people of Nepali lineage. There is also a temple of these people at the pinnacle beside which the tastefully built viewpoint is situated. From here a cemented footpath goes down through the forests and ends at the lake below. The view of the lake from places on this walking trail is quite a sight, apart from ofcourse the entire Kanchenjunga smiling at the top of the horizon. The specialty of this place is the absence of any other taller mountain in its immediacy, which grants Mankhim a commanding view all around. There is a homestay just 20 steps down from the temple which I will personally recommend for its location. Aptly named, Kanchenjunga Mirror Homestay, run by an ever-smiling Rai family, the view just out of bed is to die for. All the places discussed till now are before Rongli, hence no permits are required to visit them. These places are generally used as a stopover for the first/last night for the old silk route. That being said, these places have tremendous potentials for tourism by themselves as well. Once the necessary permits are obtained from Rongli, the actual fun begins. The smooth tarmac will be a pleasure for those driving their own vehicles. Do take a moment to introspect the fact that centuries ago, caravans of horses commuted these same paths with items of trade. Apart from articles of business and perhaps more importantly, cross-cultural wisdom, spread of Buddhism, inter-regional travel and exchange of humanity took place for hundreds of years predating any other form of communication. Shortly after getting started from Rongli, Lingtam is where the permits will be checked. The names of the travelers are registered to keep track until one exits the region either from the Gangtok side or back here again. Few homestays have sprung up here as well in recent times. There is a small park by the side of the road beside the river with big rocks scattered around. Nice place for a few clicks. Around 15 KMs up from Rongli at around 8000 ft., Padamchen is all about greenery and solitude. 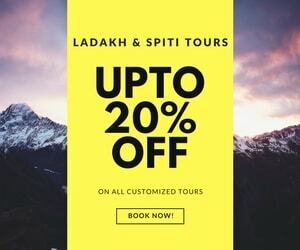 The place offers sweeping views of the adjoining valleys with Himalayan evergreen forests, a pleasant climate all year, untouched walking trails inside the adjoining forests and if you are lucky enough, sightings of rare species of birds and animals such as the Himalayan Black Bear, Red Panda and Steppe Eagles. There is a wooden Forest Rest House dating back to the colonial era where tourists can manage to stay at apart from several homestays that have sprung up recently. Probably the most popular of all places on silk route, Zuluk at 10000 ft. about 10 KMs up from Padamchen through thrilling hairpin bends, was even in a recent point of reality, a roadside Himalayan ‘bustee’ of about 100 houses. All that changed when a denizen named Mr. Gopal Pradhan started his homestay Dilmaya Retreat on the insistence of Mr. Sebastian Pradhan of Reshi. Together, they coordinated to pull this circuit out of oblivion and into public access. His homestay is the oldest in the entire of the Silk route. Atleast 6-7 other homestays exist nowadays in Zuluk, some infact are better in facilities than Dilmaya. Zuluk is also known for its spring bloom of Rhododendrons which practically paint the treeless slopes in vivid hues of red and purple. The views specially in the mornings are breathtaking when the sun rises from the horizon and due to the elevation, the valleys below are engulfed in clouds, providing a sensational scene of a sunrise being witnessed standing above the white mist. In the winter months, Zuluk experiences heavy snowfall which carpets the slopes and the roads in white. There is a big army base too in Zuluk. Apart from the hills of Sikkim, a portion of Bhutan in the east, can also be viewed from Zuluk. Zuluk inspite of its elevation does not offer a clear peep to the Kanchenjunga Range and the Trans-Himalaya. Three strategic viewpoints close by are popular for that matter, especially for the sunrise, as it generally gets foggy and gloom in the afternoon in this region. Just 6 KMs out of Zuluk is Ganek, It is more popular for the view of the Zuluk Loops. 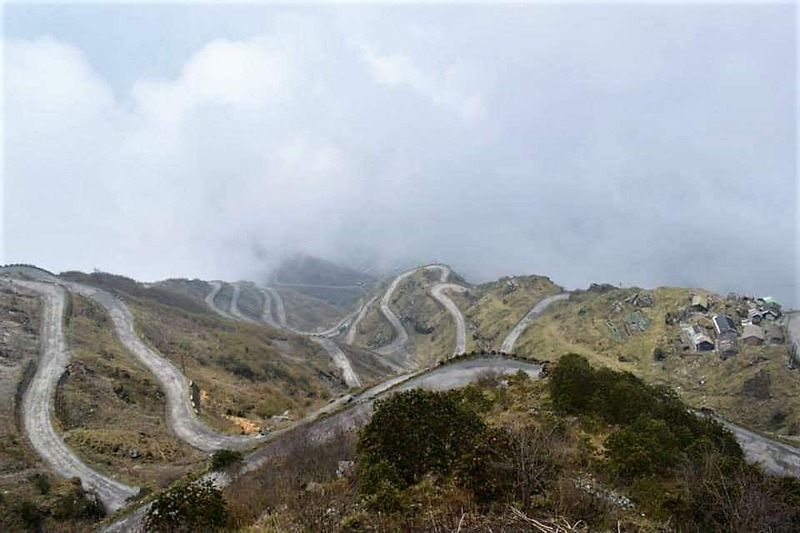 Around 30 hairpin bends are visible if the weather is clear. Thambi Viewpoint at 11600ft is particularly famous for the sunrise over the Kanchenjunga, besides also offering a majestic view of the loops. The loops look like a serpent laying over a mountain ridge. Carrying a pair of binoculars is advisable. 16 KMs from Zuluk, travelling up through exhilarating hairpin bends (around 32), at around 12000ft, Lungthung is in my bet the best of the three. The entire panorama of Kanchenjunga is visible in a poised directness from here. Make sure you start early from Zuluk if wishing to see the sunrise out of here. As the eastern night sky starts to bleed the first light before the sun actually rises, while the billion stars are still twinkling, the morning star the brightest, keep peeping westward every now and then. While the entirety will be still pitch dark, between the west and east, suddenly at a moment of miracle, the summit of Kanchenjunga invisible till then will bloom up in vivid red. Gradually hence, the victory of light over darkness will unfold, as if ceremoniously being celebrated by Mother Nature. The hues on the great Kanchenjunga will change from red to pink, then gold to silver. The eastern horizon brightens up spectacularly, vanishing the cliché stars, for quite a fantasy of ‘sea of clouds’ underneath your feet. White mist waves weaving an inconceivable magic for the eyes. Probably the ‘apple of the eye’ of the entire Silk Route, Nathang Valley at 13500 ft. is magnificent. Originally inhabited by Tibetan yak herders, Nathang Valley in modern times is gaining popularity due to its pristine landscapes. Sometimes also referred to as ‘Ladakh of the east’, it indeed has some similarities. 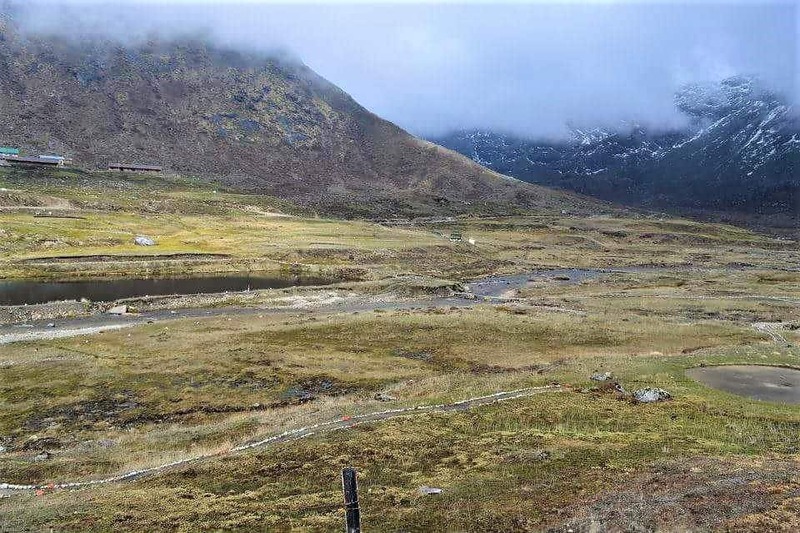 A flat grassy valley interspersed by winding streams of glacial melt surrounded by daunting barren mountains. It witnesses a riot of colors during the blooming season of Rhododendrons between June and September. 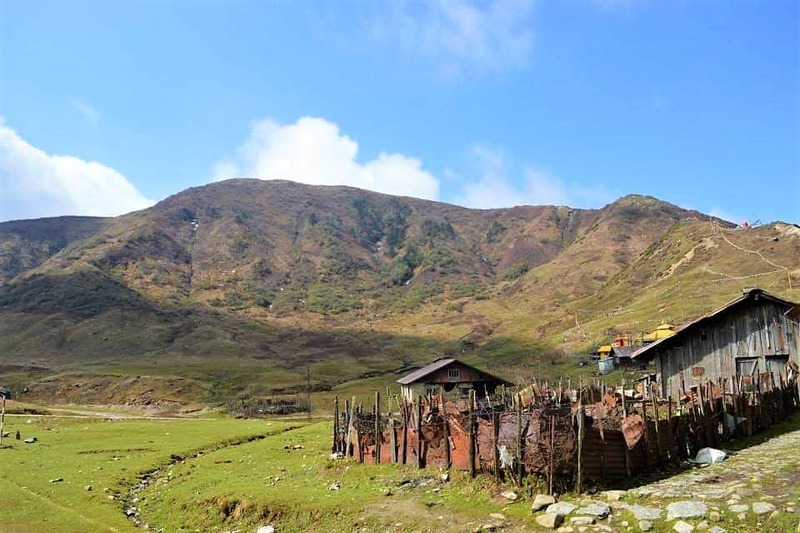 Unlike any other place in the silk route, this small village of some 50 modest wooden houses are inhabited by people of Tibetan origin. The valley changes its theme with time. From being engulfed with thick fog where visibility would be less than a meter, to pompous brightness in the sunlit mornings. Around 5 homestays take guests these days, some of which are traditional wooden houses. The altitude of the place makes it quite chilly in the nights, and if it is windy on top of that, it can get quite unbearable. There is a temple on a hilltop at the village. Be cautious before exerting on the steps, but if you get to the top, the view of the entire village and the extended valley will carve a place in your memories forever. Prayer flags adorn all corners of the village which makes it more colorful. There is a wooden high school in the village, which is quite remarkable given its remoteness. The village gets intermittently inaccessible in winters when it recedes under thick blankets of snow. The surrounding slopes of the village are ideal for skiing and government of Sikkim is in talks with the army to set it up as a destination of winter sports. Apart from the homestays, an old Dafter Bunglow has been renovated recently by the ministry of tourism for accommodation. After Thangu in North Sikkim, Nathang Valley is the second highest place in Sikkim where tourists can stay but again, spending a night at 13500 ft., the body must be acclimatized properly. Now this place is elusive. Very few people properly know about where it actually is. Even the locals of Nathang Valley and army officers posted there could not tell us about it, however it definitely is somewhere within a radius of 5 KMs from Nathang Valley on the main road. One of my friend could locate it successfully and witnessed a sunrise which left him, in his words, ‘spellbound’. It is an old army bunker atop a hill. A small uphill tread from the road would take you up there. The walls of the bunker have bullet marks from the Sino-Indian war in the early sixties. The location is perfectly strategic giving a 360-degree unhindered view of the surrounding. At sunrise, the bunker floats above a sea of clouds providing views of not only the entire Kanchenjunga massifs, but as far as the plains of Tibet on the North where the great Bramhaputra river (known as Tsongpo River in China) can be seen like a winding stream of molten gold echoing the first lights. Other distant peaks of Tibetan Plateau, western Bhutan, the Tarai plains of Bengal and even the hill town of Darjeeling can be spotted from the Eagle’s nest just like an Eagle would see it. An experience of witnessing a sunrise from up here would truly be mesmerizing. On a clear day, if a lake manifests emerald blue hues and appears in shape like an elephant, it will be Kupup Lake. At the centerstage of a glorious adjoining valley, a small village Kupup with a sparse population and a police check post is situated on the banks of it. Bitan Cho, as it is locally called is also referred to as Elephant Lake due to its resemblance of shape. Memencho Lake is another gorgeous high altitude lake quite near to Kupup. Unlike Bitan Cho, this lake is surrounded by straight standing conifers on all sides which makes it all the more alluring to the eye especially after a fresh snowfall when the trees wear a layer of white. This lake cannot be accessed directly by a car. A downward trek of 4 KMs through a winding road will have to be made to reach its shores. There is a beautiful view point set up at the banks. Few years back, accommodation in an inspection bungalow was started just beside it but could not be sustained due to the harsh climate almost around the year. Fed by the melts from the Jelep La Mountains just above it, the lake is known for changing colors with change in light conditions in a day. About 15 KMs from Kupup, an untouched valley remains lost in ignorance due to its geographic immediacy with the international borders. Exotic is the word that would probably come closest in describing Tukla Valley. An extension of the lower Tibetan Plateau, at 13000 ft., vast and flat in expanse, with the Trans-Himalayan massifs smiling over it, Tukla Valley has potential to become what Yumthang could manage. Only a small part of the valley is accessible to civilians towards its eastern end. The valley is enveloped in red in the blooming season with rare orchids and rhododendrons. The access to Jelep La (also out of bounds for civilians) goes through the valley. A heroic expedition under Colonel Younghusband of the British Indian Army was led through the Jelep La in 1904 to capture Lhasa. A memorial for the lives lost thereby stands to this day in Tukla. Another fascinating landmark of Tukla Valley is an Eighteen-hole golf course which has its place in the Guinness book of world records for being the highest in the world at 13025 ft. Called Yak Golf Course, for the reason being, senior golfers are transported across the fields on yaks. The course spreads across natural streams. Tournaments like the Kalimpong Cup has been held here. 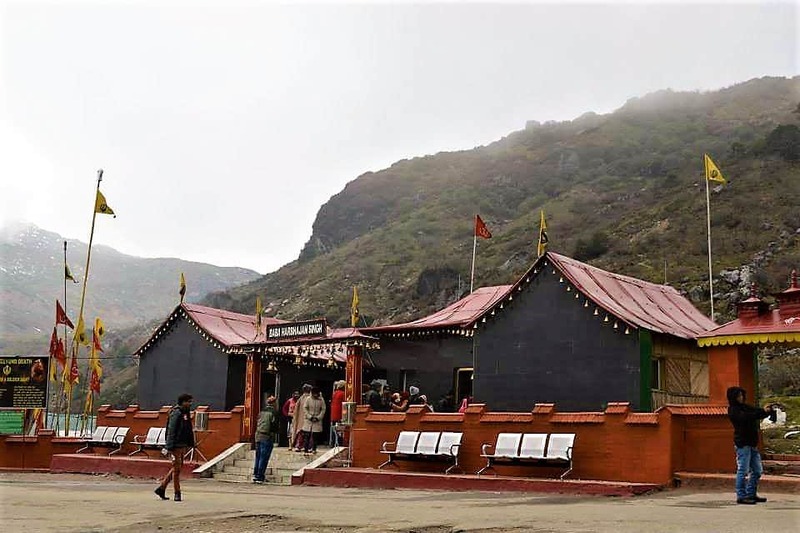 Described in my earlier article on Gangtok, the new Baba Mandir which is a standard part of the Changu – Nathu La daytrip out of Gangtok these days, is a newly built structure in honor of baba Harbhajan Singh. The actual bunker, in which baba resided falls on the old silk route. It is also maintained with pure belief by the jawans of whichever regiment serves here. One can go inside the bunker and see baba’s bed, shoes, other articles etc. A lot of stories fly around, like how the bed is neatly draped every day and is found crumpled every morning, as if someone has slept on it, or how his shoes are found mud laden after being polished every now and then, etc. What is more astonishing, is the amount of honesty and truth in the eyes of these courageous men who narrate these tales. The trekking trail for Memencho Lake goes down from opposite the road from here. The backyard of the bunker is cordoned off and is said to be strewn with landmines laid during the war of 1962 in anticipation of a Chinese invasion which never happened because of “blessings of baba” and was never taken out. Baba’s favorite dry fruits are served as Prasad to everybody visiting here. About 10 KMs from here is the new Baba mandir and shortly following which the Silk Route merges with the conventional road towards Nathu La out of Gangtok. The Winters are generally harsh and has the risks of roads getting blocked due to snowfall. However, this route is cleared up with priority by the BRO. The places mentioned, specially Gnathang Valley and Dzuluk are becoming increasingly popular as winter destinations for witnessing snowfall and the clearer views. Mid-April to Mid-June. Then October-November, avoiding the monsoon months would be the best periods to make a visit. Apart from some of the places in the foothills, all other staying options along the circuit are homestays. One can expect clean rooms with attached western toilets in almost all of them. Some of them are even more luxurious with TVs and Room-heaters. Extensive information about the places are widely available on the internet. Kanchenjunga Mirror at Mankhim top, and Palzor Homestay at Nathang Valley are where I stayed and loved both. Apart from Rongli, there aren’t any restaurants or eateries elsewhere. The homestays generally charge an inclusive price per head including stay and food, ranging from 800 to 2000 INR, varying with place, season, group size and your bargaining skills. The quality of food served are generally quite good. Ideally a timeframe of 4 days should be spent exploring this route. The place with what it holds within it deserves that amount of time. However, a trip of 2Nights & 3Days can cut it. It would only give you enough reason to come back again someday. DAY 2: Reach Rongli in the morning and obtain the permits. Thereafter proceed on the Silk Route. Plan the second night at either Padamchen / Dzuluk / Nathang Valley. If considering to do the entire circuit, i.e., Rongli to Gangtok or vice versa, avoid the winter months, as it gets unpredictable. Zuluk is at 10k feet, Nathang Valley is even higher, if travelling with elderly or infants, take caution. At any point, if anything goes south, head straight to the nearest army camp, they have all necessary facilities including doctors. If self-driving, give the army trucks a little leeway as this road is primarily for them. Zuluk and Nathang Valley get windy and bitingly cold at nights, even in peak summer. Carry appropriate woolens. Avoid driving after sunset as there is hardly any vehicular movement after that. Even in daytime the amount of traffic is very slim apart from the convoys of army trucks. Until a decade ago, this region was completely off limits for everyone except the local villagers. Even now, Foreigners aren’t allowed at all. Only Indian tourists on providing an identity proof and a passport size picture are provided with the required Inner Line Permits. Keep an original ID proof handy as it might be asked for at one of the check posts. It is better to let your homestay owner or driver of your vehicle to handle this matter which they are quite happy to do. The Permits for the Old Silk Route are given out of both Gangtok and Rongli. However, there is one catch, as far as I am aware, the permits for Nathu La are only given out of Gangtok. Which means, if you are entering from Rongli and exiting from Gangtok, you cannot visit Nathu La. Do check once with your homestay owner, as sometimes they being locals, know how to bend little rules here and there. BSNL, Airtel and Vodafone work at most places except the region between Sherathang to Nathang Valley where nothing works. Between Rongli and Gangtok, there is one single PNB ATM near Changu Lake within an army transit camp. It is claimed that this is the highest functioning ATM in India at more than 12000 ft., but please do not pin your hopes on this. Rongli and Gangtok have several ATMs. 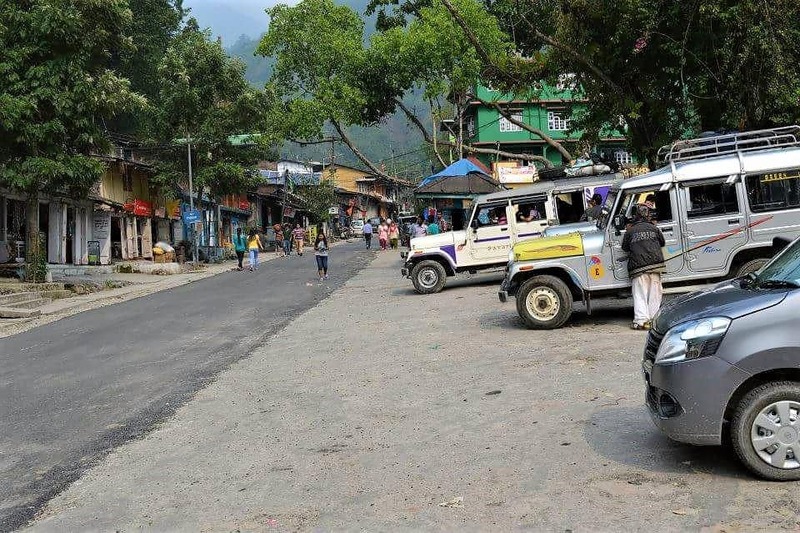 There are no hospitals between Gangtok and Rongli in this route, however, the army bases are more than helpful in case of need. In fact, the villagers of this region too depend on the army medical facilities. New Jalpaiguri (NJP) is the nearest railhead to both Rongli and Gangtok. Bagdogra (IXB) is still the nearest operational airport. 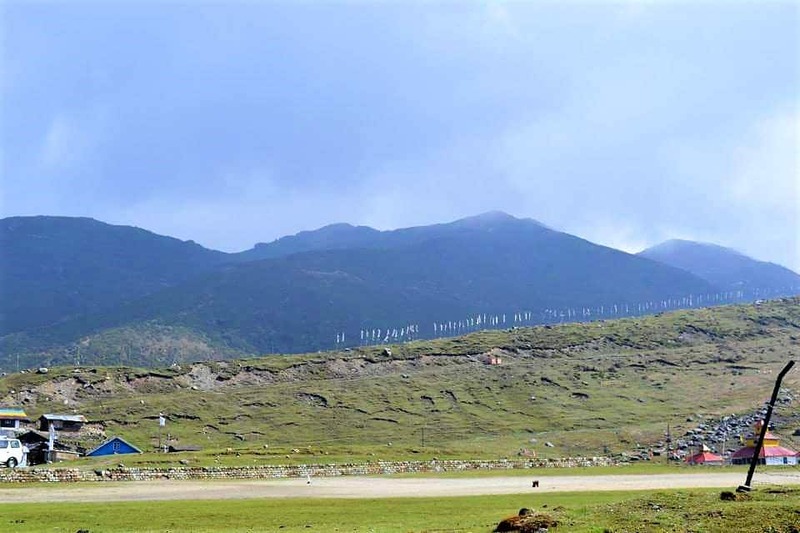 Pakyong airport, the only airport in SIkkim was recently inaugurated by our Prime Minister and is poised to begin operations from around second week of October, after which it will be the closest for all places in Sikkim. Public transport is available for Gangtok and Rongli from NJP and Siliguri frequently. For Rongli, direct share jeeps are less in number. Break your journey from either Rangpo or Kalimpong. Sadly, for the Silk route, availability of shared jeeps on spot is absent. However, travel agents club people together into bigger vehicles. For couples or small families on a budget it is better to take a conducted package than to hire an entire vehicle. There are many reliable agents available. For any help feel free to drop a comment. If you are one of those travelers who could do without the luxuries of hotels for places that are worth it, if silence and tranquility calls out to your core, if nothing else matters over the rawness of nature to you, or if there is that bone in your body which craves for a little adventure or the thrill of reliving a definitive part of history, the Old Silk Route is your kind of place. Come here for the unforgettable views, come for the altitude and its thin air. Come here for the birds or come for the soft-spoken red-cheeked people with a genuine smile pasted to their faces, come for the greenery, come for the winding roads, come for the pristine lakes, come for the flowers that grow above the tree-line, but do come for sure. We are a family of two adults and a child of 5 years age. We are planning for silk route tour between 23rd of March and 29th of March. 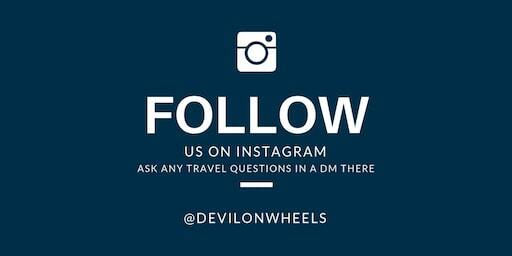 Please get in touch with us asap. Thanks. Hope it helps. have a great trip. Can you please provide contact no of few car operator for hire A car to visit zuluk n nathang for one day.